* Share price as of close on October 1, 2013. Shares outstanding at the end of the most recent quarter exclude treasury shares. Trading unit will be changed to 100 shares on November 27, 2013. * Estimates are those of the Company. A 100 for 1 stock split is expected to be conducted effective December 1, 2013. This Bridge Report provides details of Nihon Enterprise Co., Ltd. and its first quarter of fiscal year May 2014 earnings results. Nihon Enterprise is a "mobile solutions company," with two main business segments including the Mobile Content Segment, where various contents including lifestyle related and traffic information services are created and distributed to smartphones and other mobile devices, and the Solutions Segment, where contents creation, operations, systems creation, affiliate advertising, reverse auction, and IP-PBX solution (Cost reducing) are provided. Furthermore, Nihon Enterprise is also promoting efforts to expand its business into overseas markets including contents provision in China and India. Nihon Enterprise maintains a unique strategy focused upon the development and ownership of its own contents created in-house as a means of differentiating itself from its competition and achieving high profitability. This strategy has also enabled the Company to expand sales of its performance based compensation based (Success fees) contents through cooperation with cellular telephone sales companies to conduct affiliate program contents sales (Real affiliates developed independently). The Nihon Enterprise Group is comprised of seven consolidated subsidiaries including the company Dive Co., Ltd., which provides advertising services, at the LOUNGE Co., Ltd., which provides music related services, Advanced Traffic Information Services, Corporation (ATIS Corp.), which provides traffic and other information services, 4QUALIA Co., Ltd., which provides web and mobile site development and maintenance services and contents development, Enterise (Beijing) Information Technology Co., Ltd., which operates cellular telephone retail shops in China, Beijing YZH Wireless Net Technology Co., Ltd., which provides mobile contents planning, development and solutions, Rice CZ (Beijing) New media technology Co., Ltd., which provides IT related educational services. The Group also boasts of another three non-consolidated subsidiaries including and One, Inc., which provides voice communications related solution services, Rise MC (Beijing) Digital Information Technology Co., Ltd., which provides mobile contents distribution and character licensing services, and NE Mobile Services (India) Private Limited, a local company operating in India. Efforts to respond to changes in the mobile environment accompanying a shift from feature phones to smartphones are being promoted inside and outside of Japan. With regards to Japan, efforts to develop responses to the new age of smart devices that lead to expansion in the Mobile Content and Solutions Segments including alliances with cellular telephone sales companies, provision of in-house contents to mobile communications carrier for their flat rate and unlimited usage services (au Smart Pass, YAHOO! Premium, Sugo Toku Contents), establishment of reverse auction as a commercial solution (Nippon Open Market) and IP-PBX solution deployment are being conducted. At the same time in overseas markets, efforts are being made to facilitate business foundations in China and India, countries which boast of large populations and the potential for strong growth. As part of these efforts, Nihon Enterprise endeavors to promote digital comic distribution and cellular telephone sales businesses are progressing smoothly. Furthermore, the rapid diffusion of smartphones and tablets is acting as a tailwind for the distribution of E-Book (Distribution services using iPad applications was launched in December 2011 through an alliance with India's lifestyle magazine company called MAGNA) in India. Efforts to capture users of smartphones along with the shift in the market from feature phones is progressing smoothly, and smartphone monthly subscription basis service users exceeded 50% of total users in May (As of August, smartphone monthly subscription basis service users accounted for 55% of total users). Provision of fixed fee unlimited usage basis contents to carriers, effective results from collaboration with cellular telephone sales companies, and the provision of stamps developed in-house for messenger service applications called "Stamp Kobo (Factory)" (App Store, Google Play Store) have begun and special emphasis will be focused upon messaging applications. Moreover from the start of the second quarter (September to November) in September, NTT Docomo launched its monthly subscription based website for iPhones along with the start of iPhone sales on September 20. 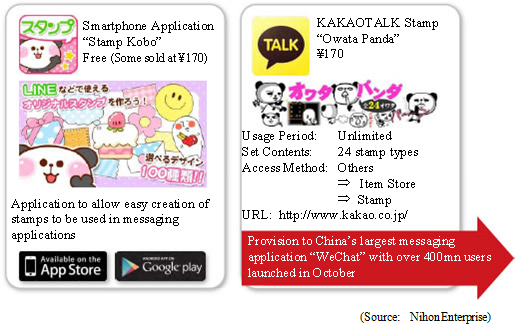 Furthermore on September 12, the provision of "Owata Panda" stamps for purchase by the over 100 million users of the KAKAOTALK (http://www.kakao.co.jp/) free telephone and mail application in over 230 countries around the world was launched ("Owata Panda" is a highly popular character in Nihon Enterprise's comprehensive Deco Deco Mail.). Various efforts utilizing reward applications for existing contents to capture younger aged users who seek out "free" services are being implemented, and successful results have been achieved in both leveraging of existing contents and capturing of smartphone users. The "Woman's DIARY" mental and physical health support application, which has come to be regarded highly by women users, is expected to be translated into other languages (Translations into English, Chinese and Korean have already been completed). Nihon Enterprise conducts shop affiliations advertising sales relating to contents created by other companies and seeks to expand its alliances for smartphone applications (Participation in new platforms) in its solutions business. Store front affiliate advertising sales are being expanded to include other industries where face-to-face sales are conducted in addition to the promotion of this service at its traditional locations of cellular telephone stores. Furthermore, an alliance has been formed with Sanrio Co., Ltd. for its Internet provider service "Sanrio Web" to provide "Run-Run Hello Kitty" miniature garden game (A cultivation simulation game that allows users to grow miniature gardens that is in principle free with some sections for purchase by users) over NTT Docomo's mobile site "d Game". Nihon Enterprise is cultivating operational solutions as a new source of earnings with the official launch of a specialized portal reverse auction site called "Nippon Open Market" (http://www.open-markets.jp) in June, and an IP-PBX solution called "AplosOne" in July. "Nippon Open Market" is the industry's only portal site specializing in a reverse auction that enables companies and educational institutions (Buyers) to complete transactions with superior merchants (Suppliers) in a fair and transparent system. In July, the provision of this reverse auction and the "Profair" estimate and collection system was started on an application service provider (ASP) basis. "Profair" is expected to lead to quick diffusion of the reverse auction system by allowing both buyers and sellers to improve their usage experience (A special campaign for national and private universities was launched in August). At the same time, IP-PBX solution "AplosOne," an in-house developed IP-PBX software of the voice communication software development company and One Inc., which was turned into a subsidiary in March, is based on the open software "Asterisk" adapted to the match Japanese telephone culture. This software enables corporations to achieve internal telephone exchange functions that rival the performance of highly expensive PBX hardware at relatively low costs, and allows IP telephone system, call recording and interactive voice response (IVR) functions to be introduced using low cost, general use servers. In the future, Nihon Enterprise will fortify its business contents by creating links to operational systems, developing application software, creating new telephone service products, and cultivating other high value added functions. According to the United States research company IDC, China became the world's largest smartphone market with over 300 million units shipped during 2013 (United States and United kingdom placed second and third with 137 and 35 million units), with the number of smartphones shipped expected to reach 457 million in China in 2018 (United States and India are expected to rank second and third at 183 and 155 million units). Nihon Enterprise is promoting a strategy of creating strong business footholds in both China and India, with particular progress being made in China with the distribution of digital comics and cellular telephone sales. Nihon Enterprise's collaboration with writers and publishing companies to digitalize highly popular Chinese novel "JiuDingJi" to be turned into digital comics that can be distributed to cellular telephones in China is taking root (Distributed to "Comix Home Base" by the leading mobile communications company in China, China Mobile.). Currently, an expansion in the companies to which the digitalized version of the highly popular Chinese novel "JiuDingJi" is being undertaken, launched its distribution to China's third largest mobile communications company China Unicom's "Comix Home Base" with preparations for the launch of its distribution to China's second largest mobile communications company China Telecom's (China's largest telecommunications company in fixed line telephones) "Comix Home Base" and China Mobile's second distribution site "Browse Home Base." In addition, new titles are expected to be released for distribution from October. In the alliance with China Telecom, the first cellular telephone shop "Dongfang Road Shop" was newly reopened in December 2012 (The operation of an existing shop was taken over and newly reopened), and the second shop "Huangjincheng Avenue Shop" was newly opened in April (Both shops located in Shanghai City). The operation of bricks and mortar shops represents the first step in the start of creating new businesses in China, with a medium to long term goal of leveraging these operations to develop the storefront affiliate (Contents sales) business through alliances with communications companies. Furthermore, China Telecom also looks forward leveraging the sales knowhow (Leveraging customer interface expertise, store experiences, and store designs of Japan) of its partner Nihon Enterprise developed within Japan. Sales of iPhone 5s launched in September are being fortified at the "Dongfang Road Shop" and "Huangjincheng Avenue Shop" stores. Sales rose by 26.2% year-over-year to ¥1.139 billion during the first quarter. Efforts to capture users of smartphones in the shift from feature phones are being promoted and allowed Mobile Content Segment sales to rise by 20.8% year-over-year to ¥579 million. The contribution from cellular telephone and shop affiliations advertising sales in China allowed sales of the Solutions Segment to rise by 32.4% year-over-year to ¥559 million. At the same time, operating income declined by 35.4% year-over-year to ¥59 million. Cost of sales margin increased from 51.3% to 54.2% along with the change in sales composition resulting from sales of cellular telephones and shop affiliations advertising in China, and aggressive increases in advertising and promotional spending for the Mobile Content Segment (Rose from ¥59 to ¥113 million) which caused sales, general and administrative expenses to rise by 32.9% year-over-year to ¥461 million. However, cost of sales ratio have stabilized and are currently trending at similar levels in the current quarter. At the same time, net income was able to rise on the back of an extraordinary profit of ¥107 million resulting from sales of marketable securities. Sales of traffic information, lifestyle and E-Book contributed to the increase in overall contents services sales. 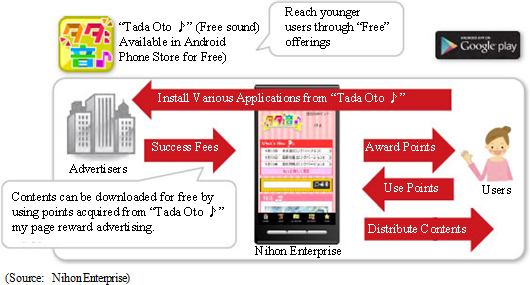 Along with the start of contents provision to the new NTT Docomo fixed fee unlimited usage service "Sugo Toku Contents," contents sales on a monthly subscription basis through alliances with cellular telephone sales companies and fixed fee unlimited usage services through the official websites of telecommunications carriers trended strongly. Efforts to fortify existing contents including reward applications and messaging application related contents (Messaging application use stamps and self made stamp application provision started) were conducted. In China, the cellular telephone sales and shop affiliations advertising services contributed to higher sales. With regards to cellular telephone sales, the "Dongfang Road Shop" store newly reopened in December 2012 and the "Huangjincheng Avenue Shop" store newly opened in April were important factors behind the rise in sales. At the same time, successful collaborative efforts with the cellular telephone sales companies and the tailwind of fortification of sales promotions of the communications carrier companies allowed newly acquired storefront affiliates to increase. In June the corporate cost reduction solution "reverse auction" specialized portal site "Nippon Open Market" and in July the "Profair" ASP service were started. Also in July, the IP-PBX solution "AplosOne" was launched. With regards to in-house contents sales through collaborative efforts with cellular telephone companies, sales of monthly subscription basis contents through alliances were booked in the Mobile Content Segment. At the same time, shop affiliations advertising sales through collaboration with cellular telephone sales companies were booked in the Solutions Segment. At the end of the first quarter of fiscal year May 2014, total assets decreased by ¥309 million from the end of the previous fiscal year to ¥4.759 billion. Declines in cash and equivalents arising from dividends and tax payments contributed to the lower total assets. Equity ratio improved by 2.9% points from the end of the previous fiscal year to 78.2% at the end of the first quarter. Nihon Enterprise calls for sales to rise by 20.9% year-over-year to ¥5.0 billion. Increases in contents provision through fixed fee unlimited usage services of carriers with which alliances have been formed are expected to boost Mobile Content Segment sales by 17.9% year-over-year to ¥2.527 billion. Increases in smartphone related development projects and strong trends in shop affiliations advertising are expected to combine with favorable cellular telephone sales in China to allow sales of Solutions Segment to grow by 24.2% year-over-year to ¥2.473 billion. With regards to profits, continued aggressive spending upon advertising is expected to be made with an eye to raising the efficiency of advertising. But an increase in the sales of in-house contents through alliances on a monthly subscription basis relative to overall sales is expected to contribute to an improvement in gross margins. Combined with the higher level of sales, operating income is expected to grow by 39.7% year-over-year to ¥520 million. Moreover, a 100 for 1 stock split and a change in the minimum share trading lot to 100 shares are expected to be undertaken on December 1, 2013. Therefore, the dividend payment of ¥2 per share effectively represents a ¥20 increase to an equivalent dividend of ¥200 per pre-split share and marks the second consecutive term of dividend increases. Nihon Enterprise's ability to respond quickly to changes is one of its key strengths. And while its competitors are suffering from a loss of members accompanying the shift from feature phones to smartphones, the Company has effectively used its contents development and business creation capabilities, and accurate M&A activities to capture opportunities arising from the shift to smartphones. Another key strength of Nihon Enterprise is its ability to stably grow its earnings over the long term through sales of in-house and third party contents and its high levels of profitability. And while operating income declined by over 35% year-over-year during the first quarter, the Company's full year earnings estimates remain unchanged and it expects to achieve a 39.7% year-over-year increase in its full year operating income. Copyright(C) 2013, All Rights Reserved by Investment Bridge Co., Ltd.